Dropped by Radir Fireshadow. Click the end of the tunnel and port to Shadeweaver's Thicket. The key also dropped for me tonight, from a Fyr Jen Flame Warder. It dropped from the wanderer who patrols the caverns off Radir Fireshower's room. 11/20/2006 it dropped off the a syl ren guardian just before Tawro Icequake. There was originally supposed to be a zone between Umbral Plains and Shadeweaver's Thicket. The zone was never put in as far as I can tell. Probably a symptom of the fact that 6 months into luclin development, large portions of the development and direction teams left sony and followed Brad. As soon as I get one of these things, I'll be corpsing it and just making a quick trip to shadowrest any time I think I'll need it. Anyone know if it's added to keyring ? This key drops off of much more than just Radir Goldenshower. It drops off many common mobs as well. It is Becuase there is a portal in Shadeweavers back to umbral. We got this key the other night from Radir Fireshadow's bosses in the tunnels near where Rumblecrush spawns. The key was no rent, but allowed me to click the tunnel end and port to shadeweaver's thicket. (= Kind of a unique little escape item. #Jerker, Posted: Mar 12 2002 at 3:29 PM, Rating: Sub-Default, (Expand Post) what is this just a port out of ubral if you get in trouble key? 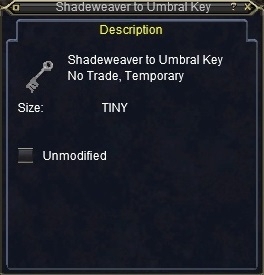 Shouldn't it be the Umbral to shadeweaver key? The Power of Hate conquers all foes.